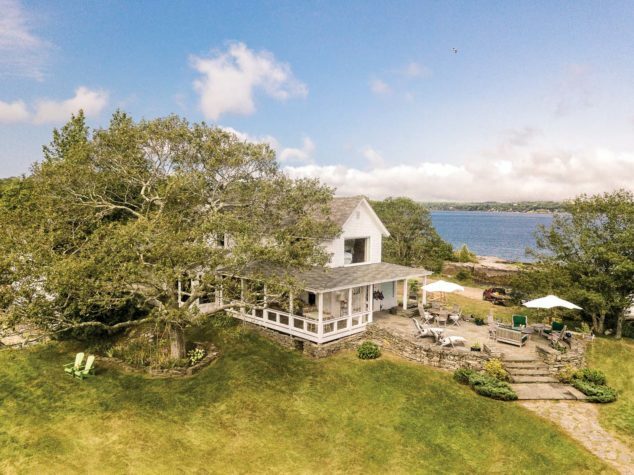 David Moser and Pamela Hurley-Moser live in this house with their daughter, Sabina, on a 14-acre compound in Harpswell. David’s father, furniture designer Tom Moser, also lives on the property, in a contemporary farmhouse with his wife, Mary Moser. A lifelong craftsman, David did much of the work renovating his house himself, calling in a select group of contractors as needed. 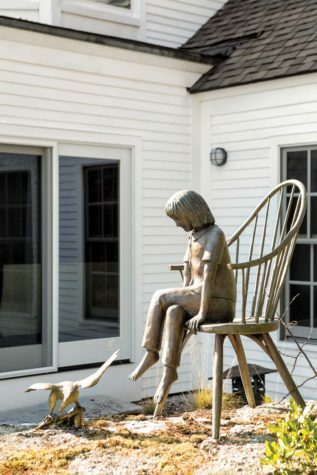 Moser, an artist and furniture maker, works in his studio on a sculpture titled Christina (inspired by Andrew Wyeth’s painting Christina’s World). Pamela Hurley-Moser makes cupcakes in the kitchen. The space is furnished with Japaneseinspired Edo stools designed by David for Thos. Moser. The cabinets are painted poplar wood, the ceiling has cherry wood paneling, and the floors are cork. Pamela and David’s house overlooks the pond, which is located on the left, and the ocean, which is to the right. Over the years, David has updated their fisherman’s cottage, adding a large window to the bedroom, a wraparound porch, and several additional rooms. David and Pamela’s living room (left) is furnished with a Thos. Moser Vita sofa and loveseat. The fireplace masonry is by their nephew, Mark Slaunwhite. 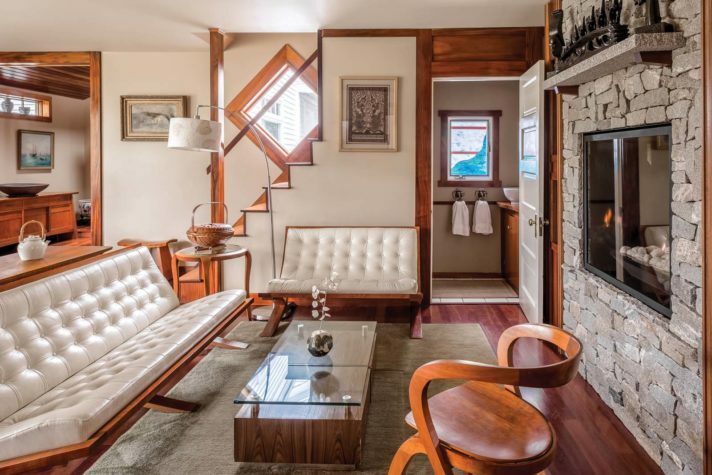 The diamond-shaped window is original to the house, and as a nod to the home’s history, David incorporated several other similarly shaped windows in the addition. While David works frequently in bronze and wood, he also enjoys creating sculptures from stone. His various artworks can be found at Gallery at the Grand in Kennebunk, Portland Art Gallery on Middle Street in Portland, Kimberly Boulon Fine Art Gallery on the island of Saint John, and at Canvas Fine Arts in Boston. 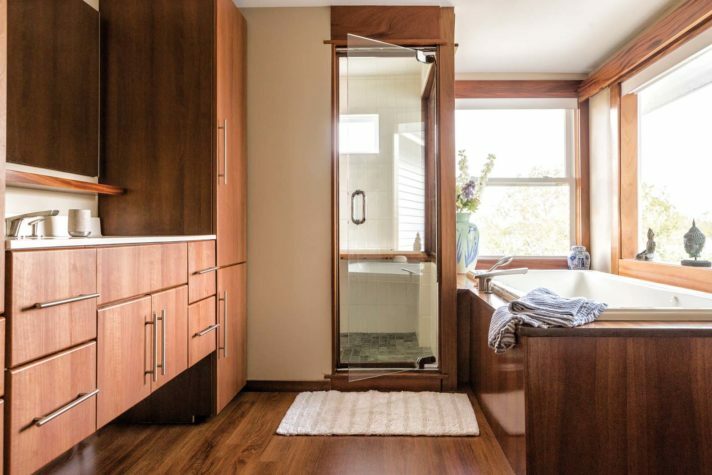 Pamela and David’s bathroom boasts ocean views, which are visible from the bathtub, as well as a steam shower, a two-person tub, and mahogany paneling throughout. David and Pamela’s dining table is made from live-edge walnut. The Edo chairs in American black cherry were custom made to fit the exact height of the table. Tom made the hutch from reclaimed barn boards. 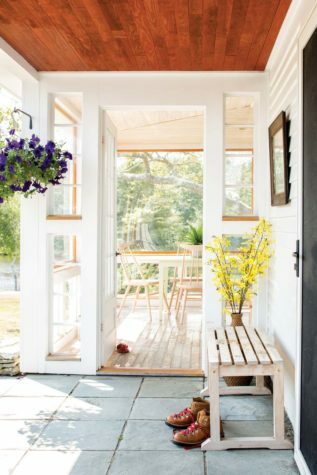 David and Pamela’s house is filled with design prototypes, such as this cottage-style dining set, shown on their seasonal porch. 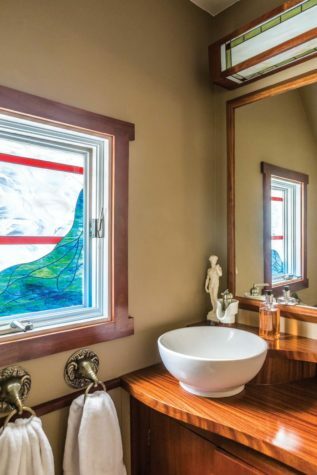 A powder room features a stained-glass light fixture and window, both made by Mary. 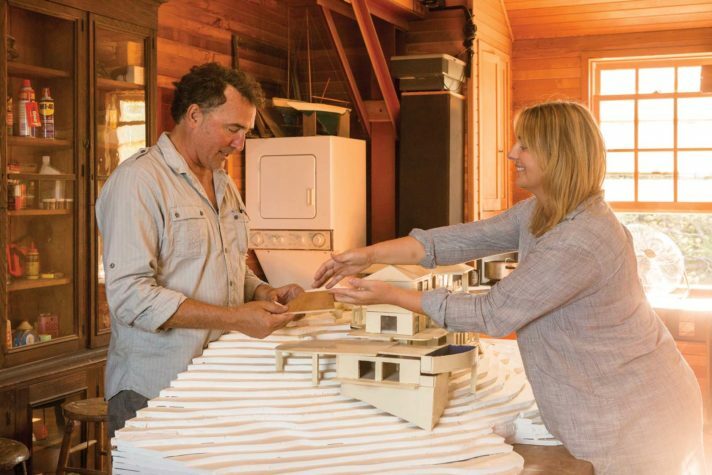 David and Pamela work together on an architectural model of their Saint John house. Soon, the house will be available to rent. 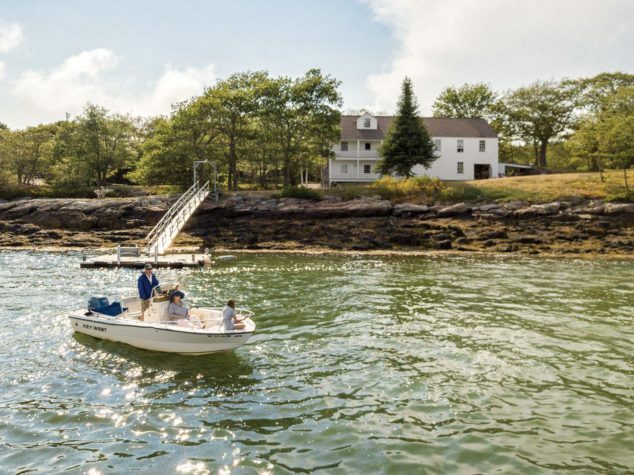 “We’re thinking of calling it ‘The Maine Escape,’” says David. This freshwater pond is fed by springs that bubble up from the granite bedrock. In the winter, the family uses the pond house as a warming shed for ice-skating. The sculpture in the front is by David and is made from hydrocal plaster. David’s brother, Aaron, worked with Tom to build this barn. Covered in cedar shingles, this is where David sculpts his bronze figures and carves his stone pieces. David, Pamela, and their daughter, Sabina, enjoy a day on the water. 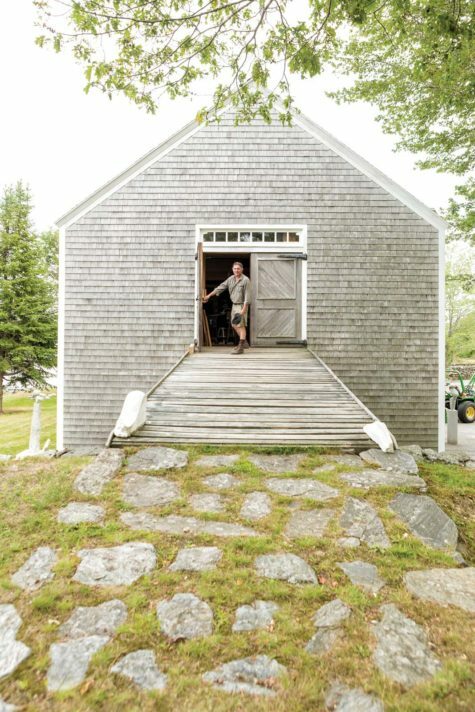 In the background is David and Tom’s barn, where the two men share a studio space. In the middle of Dingley Island in Harpswell, there is a wide, low pond shaped like the letter M. It is fed by springs that bubble up through fissures in the bedrock, and although you can stand on its shores and look at the nearby saltwater of Casco Bay, the water in the pond is always fresh, forever clear and clean. It’s this body of water that made Dingley Island a nexus of the ice harvesting industry in the late nineteenth century, explains furniture designer and artist David Moser, who lives in an updated fisherman’s cottage on a grassy hill just a stone’s throw away from the ocean. As we walk along the shores of the pond, he explains how enterprising Mainers once spent their winters sawing at the surface and loading the frigid blocks of frozen water onto a wooden conveyer belt. “It would take the ice from the pond to sea to ship,” Moser says, where it would then sit, insulated by layers of sawdust, until the chilly cargo finally reached the turquoise waters of the Arabian Sea. Wealthy Europeans living in colonized territories would use it to cool their drinks, sipping tropical juices mixed with melted water that originated deep in the earth somewhere half a world away. Stories like this seem to electrify David. Both he and his wife, Pamela Hurley-Moser, are fascinated with the history of this land, which has been inhabited for hundreds of years. (David delights in finding evidence of the pre-Columbian residents, like caches of quahog and clam shells. During his renovations, he unearthed a rusted flintlock and a coin from 1721.) 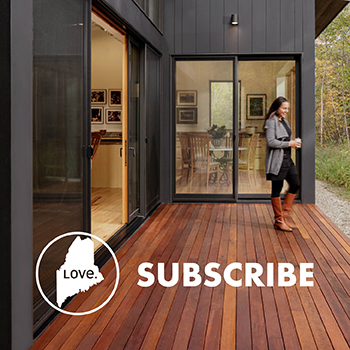 The Mosers live with their ten-year-old daughter, Sabina, on a 14-acre compound in Harpswell. Thomas Moser, David’s father and founder of famed furniture company Thos. Moser, also lives on the compound, in a contemporary farmhouse with white clapboard siding and cedar shingles, with his wife, Mary. 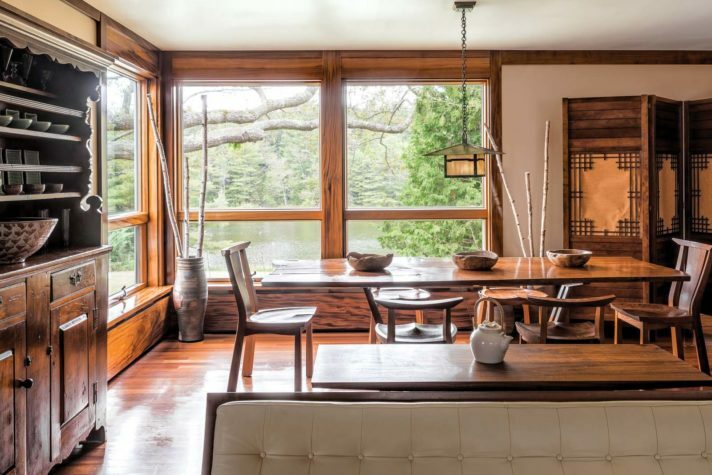 It’s a house built for two, with just two bedrooms, two bathrooms, an indoor swimming pool, and plenty of glorious wood (including reclaimed hardwood flooring sourced from a riverbed in Indonesia and cherry and walnut paneling on the walls). 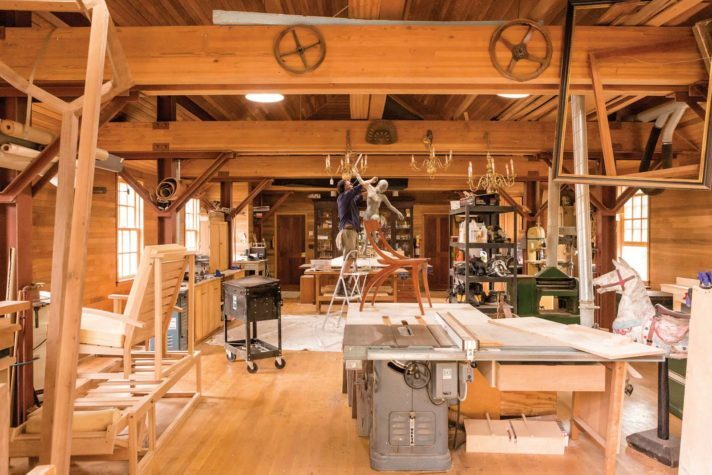 The two Moser men share a yard, a studio (which they call, simply, “the barn”), and a seemingly indefatigable desire to create, build, improve, and invent. Over the years, David has improved the four-bedroom house little by little, building a room here, redoing a bathroom there. “Not everything can happen at once,” Pam says. “We have to earn a little money, take down another wall. We do it in stages.” The house currently has a semi-open floor plan, though David plans to open the flow up even more. 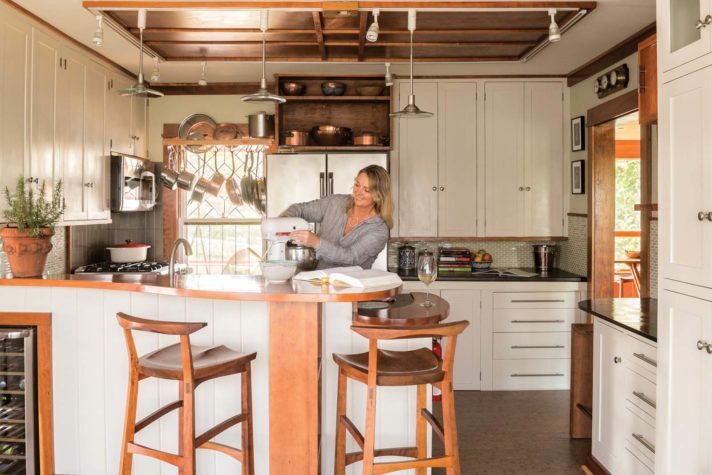 (The couple plans to open up the kitchen and living areas eventually, but that may have to wait until they finish their next big project: a house on Saint John they refer to as the “Maine Annex.”) For the most part, the Mosers do not use contractors. 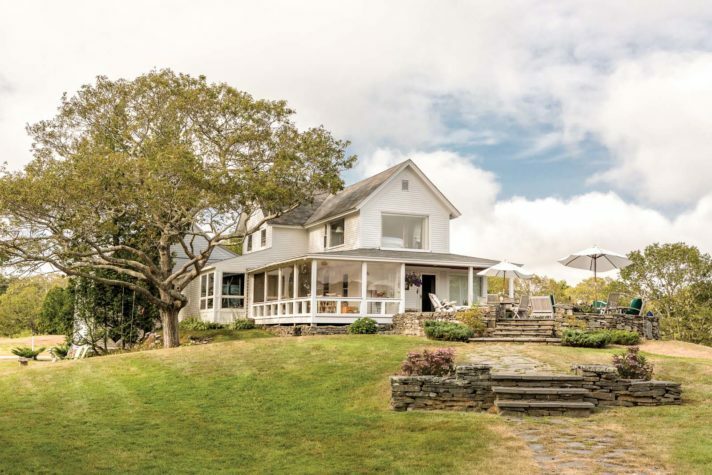 They have done the bulk of the work on their primary residence themselves, using a select group of craftspeople as needed and consulting with an architect when it came to adding on a new wing of the house. The question of how to integrate the older parts of the building with his newer additions was always at the forefront of David’s mind. “When something isn’t built from a grand scheme or a blueprint, you have to figure out how to make it feel holistic,” he says. He’s standing in the living room, and he instructs me to look overhead. A curved archway made of figured African mahogany leads from the dining area into the sitting room. “This is my solution. This archway goes between the old,” he says, tapping his foot on the Brazilian cherry floorboards, “and the new,” knocking his hands against the gleaming sapele mahogany of the wall. As we move from the downstairs living room into the dining room, den, then family room, David points out various pieces of Thos. Moser furniture, many of which are prototypes or his own experiments. He has modern sofas, graceful rockers, and a set of dining chairs and a live-edge dining table made from American black walnut. Occasionally, he reveals tidbits about his design inspiration and process. In the den, a room that’s as cozy and warm as a wooden cocoon, he draws my attention to a framed photograph hanging over a leather sofa. In the photo, his daughter, Sabina, sits cross-legged in a Thos. Moser Vault armchair. He notes the lines of his daughter’s legs in the photo and says, “There’s a significance to how she’s sitting. Her crossed legs are where I found the shape you see in the legs of the chair. The shape of her body informed the shape of the furniture, and later, this same shape informed a sculpture my father did of Sabina.” For David, inspiration does not come like a bolt of lighting or a sudden awakening. It is everywhere around him, embedded in the natural forms of his family and this landscape. The house is, in David’s words, a “wood lover’s dream,” packed with mahogany, Brazilian cherry, sapele, teak, walnut, and almost 20 other types of wood. But David and Pam’s love for beautiful items goes beyond the everyday items of furniture and flooring. 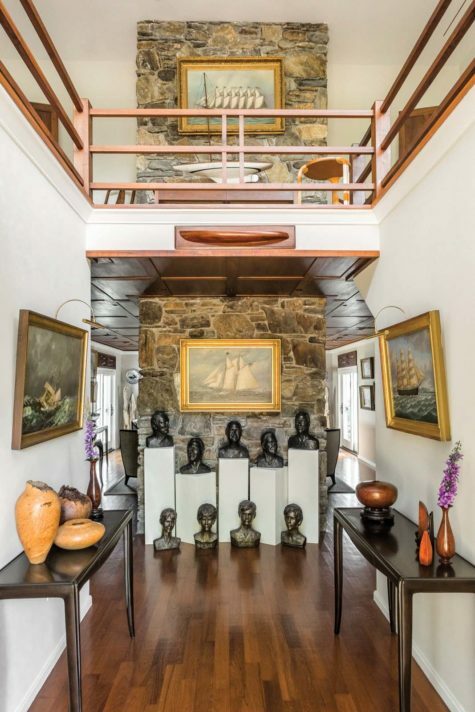 On the wood-paneled walls, they have hung fertility masks from Indonesia, paper umbrellas from Japan, and maritime paintings from the Moser family collection. “We love to mix the old and the new,” Pam says. “Everything in our home has a significance: it reminds us of our travels together as a family, or it was created by a family member.” There are stained glass windows in the kitchen and bathroom, painstakingly cut and set by David’s mother, Mary Moser, and bronze sculptures on the grounds made by Thomas, as well as masonry by Pam’s nephew, Mark Slaunwhite. Like his artistic parents, David also likes to experiment with various types of materials. 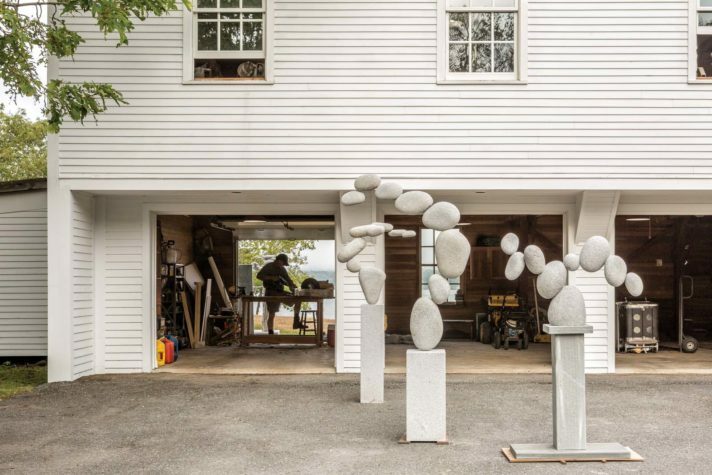 He works frequently in clay, bronze, and stone to create largescale sculptures, some of which are available at Gallery at the Grand in Kennebunk, Portland Art Gallery on Middle Street in Portland, Kimberly Boulon Fine Art on the island of Saint John, and Canvas Fine Arts in Boston. Many of his pieces are works in progress, and others he has created for himself and his family to enjoy. These remain on the property, as much a part of the landscape as the yellow pines and the placid pond. 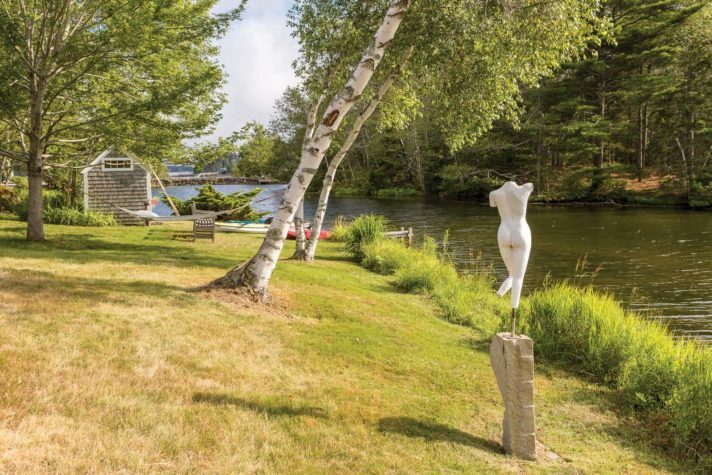 There are bronze figures seated behind trees and on boulders, and on the eastern shore of the property, a large billowing stone sail marks a waypoint for sailors competing in a local regatta. Around the back of the house, a small door opens into a Zen garden that overlooks the ocean. When David was renovating, he had to strip the house down to the foundations. “Design is all about making decisions, and I was left with a decision about what to do here once the foundation had been exposed,” he says. “I decided to turn it into my Zen space.” He walks over to rest his hand on a large granite obelisk. It’s the third in a series of granite sculptures. “You might think these are just three random stones,” David says. He smiles and waits for me to guess the meaning behind these stones. “The three bears?” I joke. “Close,” he says. “You’ve met my family. Here we’ve got me, Pam, and Sabina.” David, I’m learning, is a person who pours his heart into every hunk of clay, block of stone, and piece of wood he touches. Of course, David also works with wood inside this well-appointed workshop. But right now, his focus is on clay and bronze. Furniture design, he explains, isn’t quite as artistically rewarding as sculpting. “When I’m working with clay, it’s pure,” he says. “I work directly from my mind to my hands. It allows me to be much more expressive.” Yet the evidence of his day job is all around us, from the Japanese saws that hang on the wall to the wood shavings scattered on the floor. I run my hand along a workbench and feel the gritty remnants of sawdust. Although I’ve seen much of David’s work, I can’t help but feel as though I’ve only scratched the surface of this nimble creator. And then, as though he were reading my thoughts, David says, “There are so many stories to be told here.” Piece by piece, sculpture by sculpture, he’s working to tell them all. David sculpts figures in clay that will later be cast in bronze in his workshop. Inside Mary and Tom Moser’s house is a lap pool, which the whole family uses for recreation and exercise. 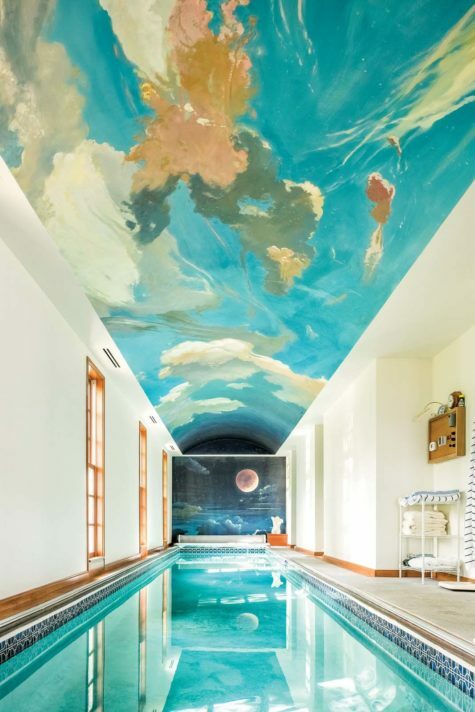 Tom commissioned a local student to paint the cloudy sky on the walls and ceilings. “The way the stars align in the painting is an exact replica of how the stars aligned on Tom and Mary’s wedding day,” explains David. Over the years, Tom Moser has worked in many mediums. He made all of these bronze busts. The busts on the floor are of his four children when they were young, while the busts on the pillars show his children as adults, plus one self-portrait. The two end tables pictured are from the Art Nouveau–inspired Sabina line of Thos. Moser furniture. (This line has since been discontinued.) The floor is made of reclaimed wood sourced from a riverbed in Indonesia. 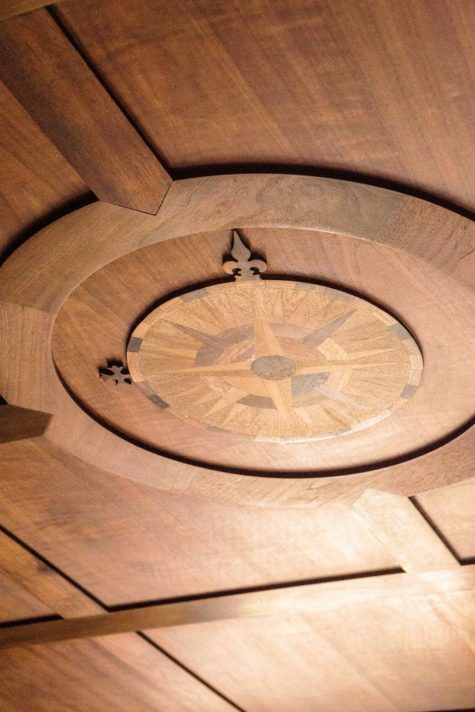 On the ceiling of Tom’s den, an azimuth compass points north.